London seems to be having a love affair at the moment with “Dude Food” and while I completely respect the need for a decent hot dog or hamburger, it took me a few attempts to get into Bubbledogs because I’m just not a fan of a three hour wait for them. So when I stumbled onto Red Dog Sandwiches half empty at 9:30pm just off Hoxton Square, I’m fairly certain I did my embarrassing white girl happy dance. I liked Red Dog because it did what it said on the tin in a no nonsense way. The dining room has an American diner feel with a MacDonald’s format. No menus, it’s on a board behind the bar. No waiter’s, order and pay when you’re ready then take a seat. It comes on a tray with mountains of napkins (no cutlery people) and that is that. However, that’s where the similarities with MacDonald’s end. 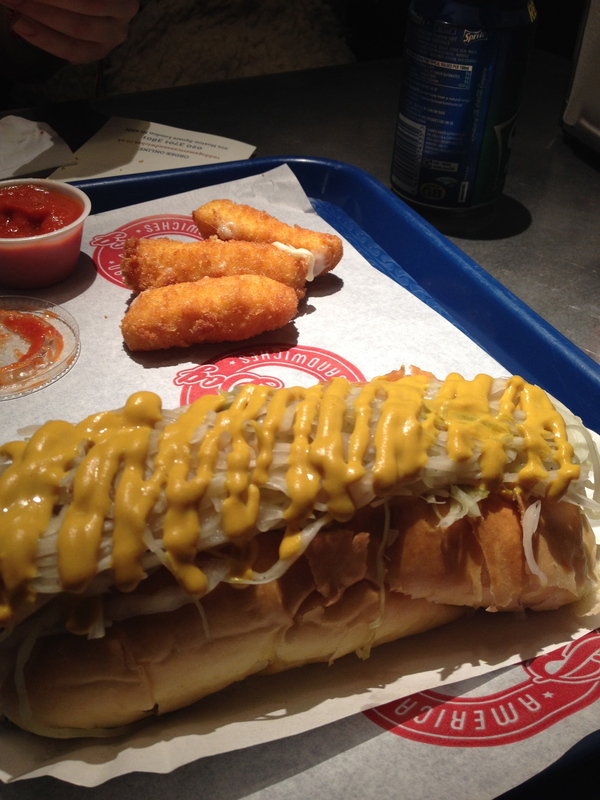 I opted for the The New Yorker Dog with a side of onion rings. The dog itself was amazing – it was clearly made with real pork, lightly spiced and tasted like you’d expect a good smoked hot dog to taste (no red food colouring to make it look like it’s been smoked). The New Yorker came with sauerkraut and mustard. The sauerkraut was a tiny bit too crunchy and sour for me on its own but the sweet American mustard balanced that out as well as the slightly sweet white bun that it came in. 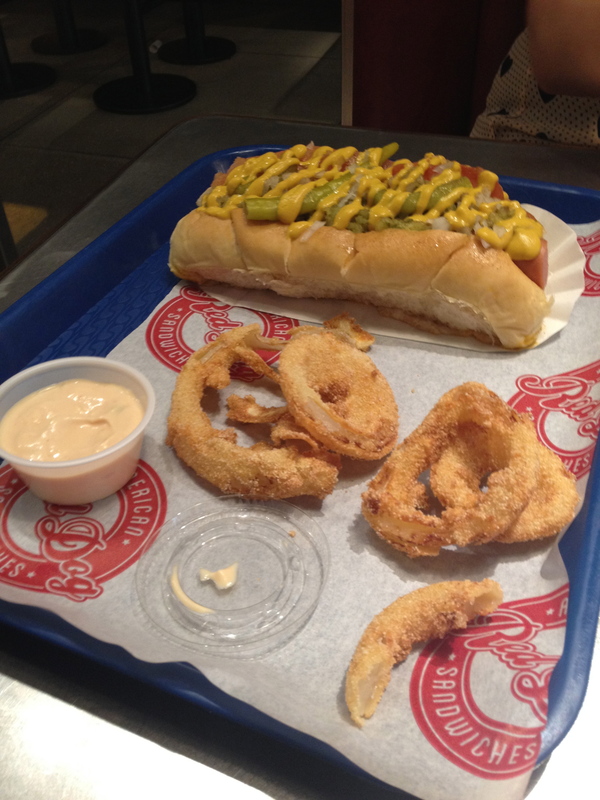 If you do go to Red Dog, please please please try the onion rings. I’m a huge onion ring fan but usually I eat one or two and then feel sick from the amount of oil. These onion rings where sweet and crispy and crunchy without being oily. The batter on the outside wasn’t the usual thick fish and chips style batter but a more crispy pancho crumb style and I easily finished the serve and could have had more. No greasy or oily at all and definitely better than fries! This isn’t a place to take a date (as I struggled to fit my hot dog in my mouth at several points and ended up covered in mustard) but if you’re after honest, simple food then this is definitely the place for you. Dude food all the rage in London? In Sydney its similar, but we’re also seeing fancy top-label chefs translating their wares to burgers. Chic burger spots are all the rage here at the moment at everywhere from Rockpool to Chur Burger (we should try one when you’re in town for Xmas!). Soda Factory in Sydney does a similar American hot dog stand style fare, with lots of gourmet dogs alongside the beers and mixers at the bar. Worth a Hungry Kitten review perhaps?